Microsoft on Monday announced its initial arsenal of handsets built around the new Windows Phone 7 mobile operating system, in what many believe is the company's last-ditch attempt to regain traction in the mobile handset arena that's fallen into the hands of rivals like Apple and Google. The Redmond, Wash.-based software giant is pitching the new handsets as "a different kind of phone" that showcase a 'glance and go' format. Company chief executive Steve Ballmer said that in today's busy world, people are spending more and more time with their heads down looking into their phones rather than interacting with the people around them. As such, he said Microsoft is looking to break the current smartphone convention by helping people quickly and easily find and consume data so that they can pick their heads back up and stop missing out on life's important moments. 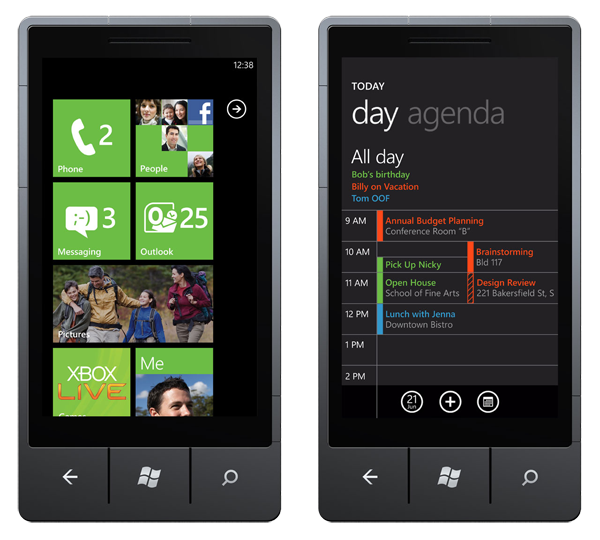 For example, one of the core features fueling Windows Phone 7, which shouldn't be confused with Windows 7 for the PC, is a new Start screen with something called Live Tiles for highlighting a user's personal content. These customizable and configurable squares of data siphon real-time updates from the Web —such as news, appointments or the status of friends —and present them at a glance on the phones' home screen. Users can also create Live Tiles from applications and music, then position them in a particular order on their Start screen. In this way, a user's Start screen can not only contain quick access to FaceBook and local weather information, but it can also display the next appointment in a user's calendar app. Other features include a social gaming network with roots to Xbox LIVE, in addition integration of other key Microsoft services and platforms such as Office Mobile, Zune, Windows Live, and Bing search. In total, Microsoft unveiled a portfolio of 9 different phones built around WVGA displays (480 x 800 pixels) from its 4 handset hardware manufacturers: Dell, HTC, LG and Samsung. They'll run across more than 60 mobile operators —including América Móvil, AT&T, Deutsche Telekom AG, Movistar, O2, Orange, SFR, SingTel, Telstra, TELUS, T-Mobile USA and Vodafone — in more than 30 countries when they arrive in parts of Europe and Asia on October 21st and the U.S. on November 8. 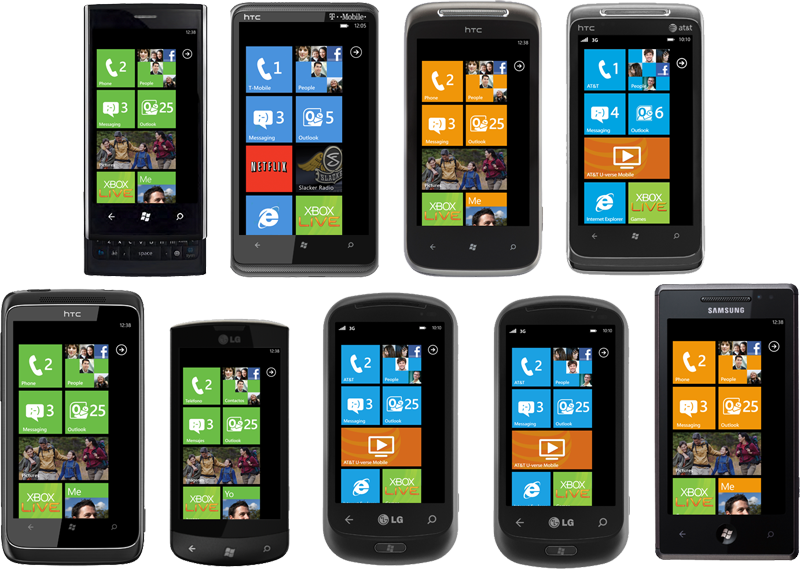 All nine of the first Windows Phone 7 phones that will ship before the holiday shopping season will include a high-performance Snapdragon processor from Qualcomm. Additional models will continue to arrive in 2011, including the first phones for Sprint (such as an HTC 7 Pro) and Verizon. In addition, Microsoft said it plans to sell some of the phones through big-box online retailers like Amazon.com. One feature that won't be present in Windows Phone 7 devices at launch is Copy & Paste, which Microsoft promises as part of a software update in early 2011.